In my book, 2021-2041 The End Times, I discuss these reliefs heavily. Armed with the knowledge of the existence of mind control of alien origin, the story told by these reliefs begin to make sense. They are a message from Ancient Egypt to our modern time, that they knew of the existence of mind control, that it was responsible for creating their occult religion, and they tell a very clear story. It is not clear to me whether or not this story is a recording of a historical event, or a prophesy of a future event; however knowing that mind control is still being used in much the same way as they depicted it in the reliefs, I hope it is an alternative to the story of Revelation. Regardless of whether or not the stories were meant to be related, they both share the common principles of mechanical mind control being used in order to subvert the will of the human civilization. This explanation of the device depicted in the Dendera reliefs makes much more sense to me than the fringe “light bulb” explanation, and complements the mainstream mythological explanation. Much of the myth’s of ancient Egypt depict accurately the use of advanced technology by observers who would have known it as nothing less than powerful magic. The view of Egyptologists is that the relief is a mythological depiction of a djed pillar and a lotus flower, spawning a snake within, representing aspects of Egyptian mythology. The Djed pillar is a symbol of stability which is also interpreted as the backbone of the god Osiris. In the carvings the four horizontal lines forming the capital of the djed are supplemented by human arms stretching out, as if the djed were a backbone. The arms hold up the snake within the lotus flower. 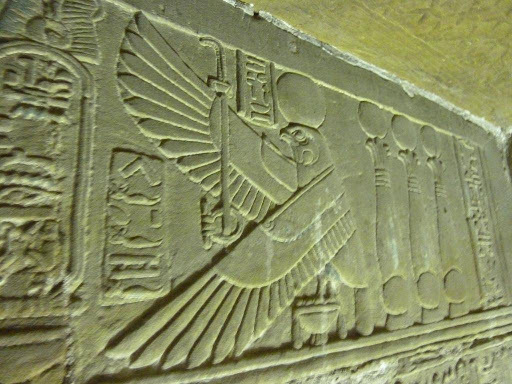 In contrast to the mainstream interpretation, there is a fringe hypothesis according to which the reliefs depict Ancient Egyptian electrical technology, based on comparison to similar modern devices (such as Geissler tubes, Crookes tubes, and arc lamps). J. N. Lockyer‘s passing reference to a colleague’s suggestion that electric lamps would explain the absence of lampblack deposits in the tombs has sometimes been forwarded as an argument supporting this particular interpretation (another argument being made is the use of a system of reflective mirrors). Proponents of this interpretation have also used a text referring to “high poles covered with copper plates” to argue this but Dr. Bolko Stern has written in detail explaining why the copper covered tops of poles (which were lower than the associated pylons) do not relate to electricity or lightning, pointing out that no evidence of anything used to manipulate electricity had been found in Egypt and that this was not a technical installation. The Light of the reliefs are coupled with the snake, an animal deified in the Egyptian religion and paralleling Satan’s possession in the Biblical story of the Fall of Man in Eden. I believe the use of the snake both symbolizes the “divine” source of the magic the reliefs describe, as well as its nefarious purpose which is obvious when you look at the reliefs. We do not know the exact origin of the Djed pillar, but its hieroglyphic meaning (“enduring” or “stability” and sometimes “column”) is not doubted. There is no apparent connection between the concept of “enduring” and the process of insulating, but even if there was, it is my understanding that the Djed wouldn’t work as an insulator. In a light bulb, the glass bulb itself insulates the filament, and no extra component is required. The “cable” is described in the text beside the depiction as a symbolic sun barge moving across the sky (in a form which is by no means unique to these carvings). It seems to be a bit of a stretch to describe this as a cable, although I suppose you could argue that the movement of the sun mirrored the movement of electricity. However, the “cable” is attached to what proponents describe as a “socket”, but is in fact a lotus flower. This flower appears in this form all over Egypt, and is always a lotus flower. Furthermore, the text beside the depiction confirms that it is a lotus flower. Sylvie Caulville worked extensively on the inscriptions in the temple. 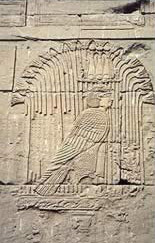 She suggested that in the carvings, Hor-sema-tawy (or Harsomptus “Horus the uniter of the two lands”) is depicted as a serpent, a falcon and as a child (Ihy the son of Hathor and Horus of Behedet). The inscription is clearly an ancient and uninformed description of a satellite, a “sun barge” moving across the sky. The Priests of the Hathor Temple were recording the location of the source of the mind control technology which they are depicting. This relief is an explanation of the story of the unification of Upper and Lower Egypt, brought about by Horus, an earlier diety of virgin birth and likely predecessor of Jesus Christ. 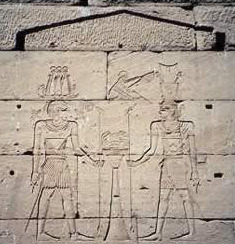 In this relief, the wielders of the technology are show as giants, like the Nephilim of Genesis 6:4, and are representative of Horus and Set from IHS myth. 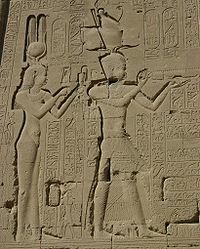 The humans beneath the light are clearly depicted as worshiping the giants, and when contrasted with the next image in the reliefs shows their clear belief that the light was responsible for causing worship. This is the essence of mind control. In addition, both sides of the relief above depict assistance from third parties, on one side it is being helped by a human like figure, with a circle over its head. This circle is representative of knowledge of mind control, and the human-like figure is a representation of what we call the Illuminati. On the other side of the image, the cable is hidden, and instead of humans the mind control light, is being assisted by a djed pillar with arms, a representation of a machine. 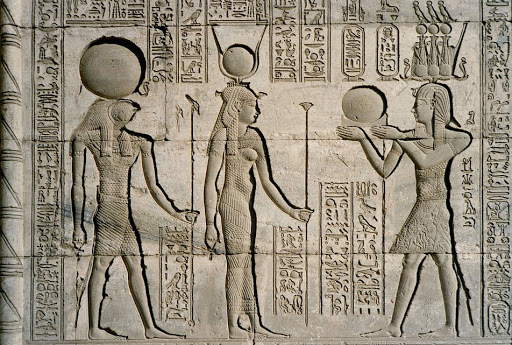 When taken with the next relief, it is possible that there is a hidden meaning on the walls of the Hathor Temple, that the relief above describes a time sequence, and each section is a slide showing the progression of mind control throughout history, it may be a grand prophesy about the entirety of human evolution. If this is the case, the humans depicted show the gradual hiding of the knowledge of the satellite described by the cable, and the vanishing of knowledge of mind control from humanity. Clearly though , from the continued worship in the second half, and the presence of the snake and light, it has not been stopped. “…there was war in heaven. Michael and his angels fought against the dragon, and the dragon and his angels fought back. But he was not strong enough, and they lost their place in heaven. After the conflict, Satan is thrown to earth along with the fallen angels, where he (“that ancient serpent called the devil”) still tries to “lead the whole world astray”. The above relief is the final in the temporal slideshow, describing the fate of humanity. In it, a third party, represented by a giant that is clearly different from the depictions of Horus and Set in the first stands against the mind control technology using a pair of swords. These swords are the cue that links this force with the Archangel Michael, and are also a testament to the fact that there is a technology, or a tool, which can counteract the mind controlling light. The relief shows that after the assistance of this outside force, humanity shown in friendship rather than worship, that civilization has been healed. It’s also important to note that in the final relief the “Illuminati” and the machine are working together, against the representation of Michael. The ‘Ba’ (bꜣ) was everything that makes an individual unique, similar to the notion of ‘personality’. (In this sense, inanimate objects could also have a ‘Ba’, a unique character, and indeed Old Kingdom pyramids often were called the ‘Ba’ of their owner). 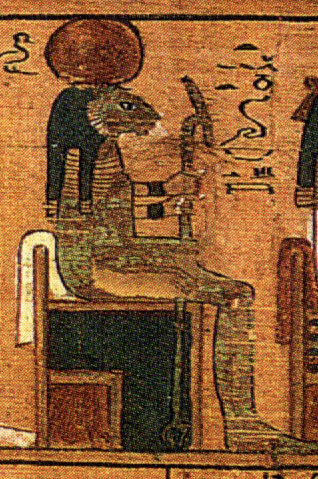 The ‘Ba’ is an aspect of a person that the Egyptians believed would live after the body died, and it is sometimes depicted as a human-headed bird flying out of the tomb to join with the ‘Ka’ in the afterlife. In the Coffin Texts one form of the Ba that comes into existence after death is corporeal, eating, drinking and copulating. Louis Žabkar argued that the Ba is not part of the person but is the person himself, unlike the soul in Greek, or late Judaic, Christian or Muslim thought. The idea of a purely immaterial existence was so foreign to Egyptian thought that when Christianity spread in Egypt they borrowed the Greek word psyche to describe the concept of soul and not the term Ba. Žabkar concludes that so particular was the concept of Ba to ancient Egyptian thought that it ought not to be translated but instead the concept be footnoted or parenthetically explained as one of the modes of existence for a person. In another mode of existence the Ba of the deceased is depicted in the Book of Going Forth by Day returning to the mummy and participating in life outside the tomb in non-corporeal form, echoing the solar theology of Re (or Ra) uniting with Osiris each night. The word ‘bau’ (bꜣw), plural of the word ba, meant something similar to ‘impressiveness’, ‘power’, and ‘reputation’, particularly of a deity. When a deity intervened in human affairs, it was said that the ‘Bau’ of the deity were at work [Borghouts 1982]. In this regard, the ruler was regarded as a ‘Ba’ of a deity, or one deity was believed to be the ‘Ba’ of another. Frequently combined with the Nemes. Uraeus (you REE us) (plural: Uraei or Uraeuses)Wadjet (spitting cobra) and Sun disk. Nekhbet, vulture wings added later. The Uraeus is the stylized, upright form of an Egyptian spitting cobra used as a symbol of sovereignty, royalty, deity, and divine authority in ancient Egypt. Manulis was a sun god of Lower (northern) Nubia. He is usually depicted wearing a crown of ram horns surmounted by high plumes, sun disks and cobras. His name in Egyptian inscriptions is “Merwel” but the Greek version, as found in the text known as the “Vision of Mandulis” is used almost universally. A chapel to Mandulis existed on the island of Philae off the eastern colonnade approaching the temple of Isis, a goddess who seems to be regarded at least as his close companion. But it is in the temple of Kalabsha (now moved to a location just above the High Dam at Aswan), the most impressive monument in Lower Nubia from the Graeco–Roman period, that the best evidence of the cult of Mandulis can be found. Constructed on the site of an earlier New Kingdom sanctuary, Kalabsha (ancient Talmis) took its present form during the reign of the Roman emperor Augustus. Mandulis, as represented on its walls, does not seem at all out of place among the other members of the Egyptain pantheon placed in his company. From the “Vision of Mandulis” we find the unforced equation of this Nubian solar deity to Egyptian Horus and to the Greek Apollo. Depictions of the Hemhem (hmhm) are known since the Amarna period but was most often represented under the Ptolemies. It appears to have had connections with the rising sun, i.e. rebirth, as it is at times shown in conjunction with the solar child in the lotus flower . Interestingly, hmhm.tj, the roarer, was an epithet for Seth or Apophis.